It’s the mother of all cat books. The book that gave new meaning to wacka-wacka and forever redefined it. Cat is the classic that started it all. 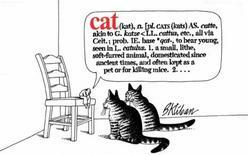 It gave a voice to catmaniacs around the country and launched an entire genre in publishing and licensing. Everybody went crazy. “Neither cute nor mysterious but instead simply and irreverently, even raucously, very funny.”—Village Voice.